Monthly 'Spaghetti Sundays' at the home of Kyle and Sarah Nash draw lots of locals at Rancho del Diablo. Kyle scoops out pasta while chatting with neighbor Hunter Wimmer. 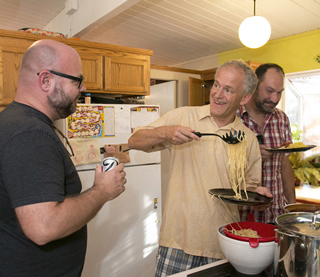 With their children at play nearby, parents dine on spaghetti and fun conversation at the Nash house: (clockwise from bottom) Sara Goetz, Chris Goetz, Sarah Nash, and Bret Peppo. Sarah Nash and son Sean take in a walk. It's never easy to state definitively when the renewal of a mid-century modern neighborhood begins. But, in the case of Concord, one might focus on a vision quest that got underway in the spring of 2009. Camila Baum, a collector of mid-century modern paraphernalia who'd recently bought an Eichler in Concord with her husband Matt, was curious. "I am dying to know what my neighborhood is called!" she wrote plaintively to the Eichler Network. "Any information?" Of course she asked her neighbors. "Oh, it was Rancho something," they would say. Armed with advice from the Eichler Network, Camila made her way to the files of Eichler architect Claude Oakland at UC Berkeley's Environmental Design Archive. Suddenly there was light. The third was Parkside, 1963, home to 77 Eichlers with several interspersed ranch houses, for a total of 187. Parkside forms a cohesive little enclave bordering a large city park with a popular pool, and lacks any through streets. Many people buy in the neighborhood because of the park. Homes there are a little larger than in the other neighborhoods, and there are more models, including the attractive double-steep-gable atrium model. Homes also cost a bit more. Inside, some homes in all three neighborhoods retain original paneling, bathrooms, and even kitchens. Some are owned by original buyers, who are particularly plentiful in Parkside. Concord itself is a draw to some newcomers, Hunter Wimmer says, arguing there is so much to do in the town there's really no need to leave—though neighbors say the sprawling city of 125,000 lacks a good neighborhood bar. But it does have a BART station minutes away by car. "We wouldn't have ended up out here if it weren't for BART," says Wimmer, who, like several folks in his neighborhood, is an educator. He teaches graphic design at the Academy of Art in San Francisco. 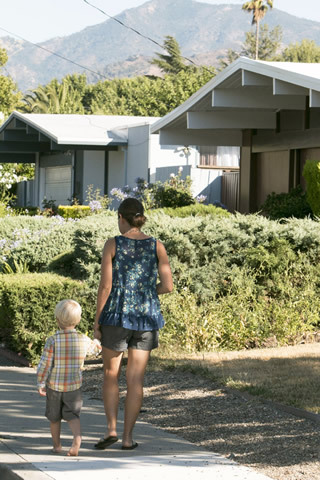 While each of the three neighborhoods has a similar story—young original families aging, years where children were few, new younger families arriving, increased interest in mid-century design—each of the three has its own personality. 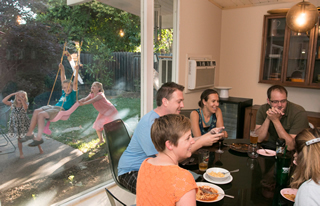 It is notable, in each of the developments, that a number of younger residents either grew up in the neighborhood, or in other Eichler neighborhoods. In each, social media plays a large role in creating community feeling. And each seems to have its own 'mayor,' a social sparkplug who makes sure people know what's up and know their neighbors. Folks in Diablo and Santos tend to know each other much more than they know anyone in Parkside. Some Parksiders, however, say they know people in Diablo and Santos. 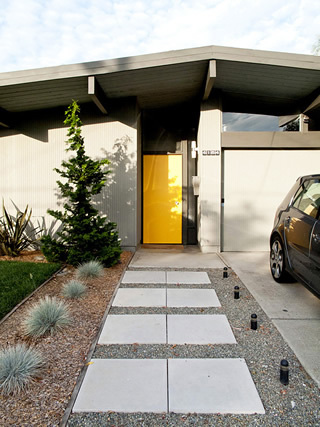 "We cross-pollinate with other Eichler neighborhoods," says Margaret Chester of Parkside. "We all know Hunter." That's because of Wimmer's blog, RedneckModern.com, which tells tales of local remodels, homes for sale, and more. Blog posts often lead to people actually meeting, Chester says, as when he posted about the availability of mahogany siding, and she rushed over to get some.